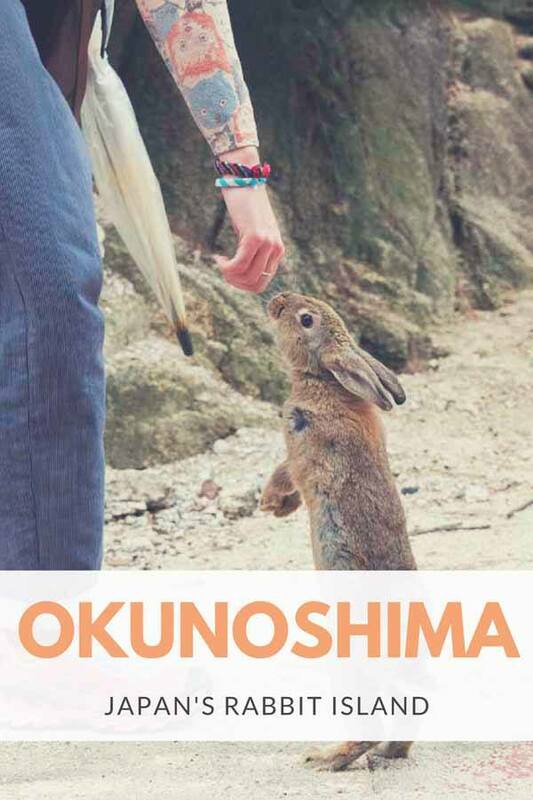 Have you ever heard of Okunoshima, Japan’s rabbit island? At first glance, it’s one of the most kawaii places we’ve ever seen and an easy day trip from Hiroshima – but it conceals a dark secret. One of the things I really wanted to do when we went to Japan was visiting Cat Island. If you know me, you’ll know I love cats – the fact that Kuching means ‘cat’ in Malay was reason enough for me to visit Sarawak, and I chase cute cats and kittens anywhere we go, from Cape Town to Jerusalem. When I started researching the matter I found out that Japan didn’t have one, but ELEVEN cat islands – sadly, none of them was close to where we were heading, and with only three weeks in the country we had to give up on the idea. Get ready for a furry kawaii overload! However, we found out that there was another super-kawaii (cute) place – Okunoshima, also known as Usaga Jima, or Rabbit Island, because of the 1000+ cute furry critters that call it home. Okunoshima is about 50 km from Hiroshima, easy to reach with a bullet train and ferry combo and making for a perfect day trip from the city. The popularity of Okunoshima is hardly a secret, made famous by viral videos of ‘rabbit stampedes’ and articles from major newspapers – but when we got off the ferry and set foot onto the island, there were only another dozen or so people. It was a rainy day in late September, with mist and low clouds hanging over the Inland Sea, hiding the island from sight until we had it right in front of us. Soon, we were surrounded by bouncing bunnies of all different shapes and sizes – babies looking like cotton fluff, black rabbits, orange rabbits, rabbits with mottled brindle fur, even some huge alpha rabbits bearing battle scars. A furry, bobbing crowd hounding visitors for treats – and losing interest as soon as they realised you didn’t have any. Yet, Okunoshima is not just cute – it’s a dark and mysterious place, with a history shrouded in secrecy. If you looked at at a map of the Inland Sea prior to 1945, there would be no trace of the island. 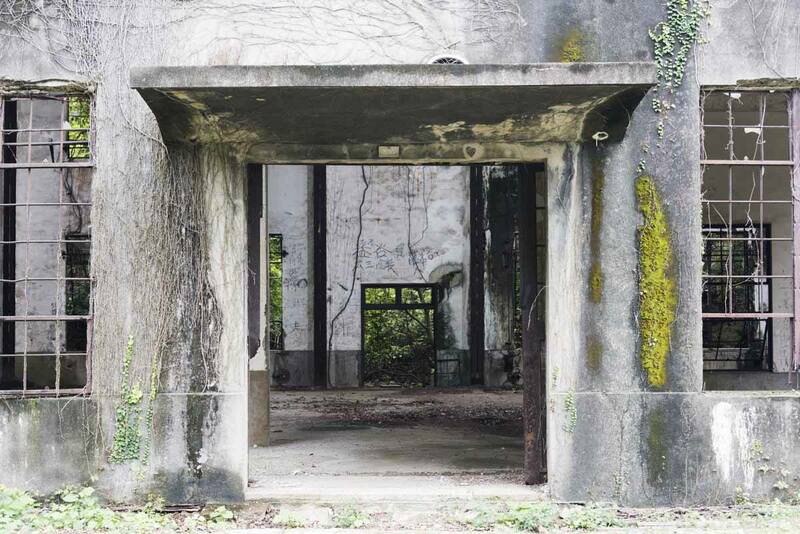 Okunoshima was a top-secret military location, housing a poison gas factory that produced chemical weapons. Production of poison gas on what is now Rabbit Island started in 1929 and continued until the end of the war. The main agents produced were yperite (mustard gas) and lewisite, causing blistering to the skin and lungs after exposure. Not many people were aware of the existence of the Okunoshima poison gas factory while it was still functioning, besides factory workers and upper military echelons. Japan was one of the signatories of the 1925 Geneva Protocol, banning the use of chemical and biological weapons. Yet, it was estimated that over 80,000 people, mainly civilians, died during the Japanese occupation of China from poison gas produced on Okunoshima. 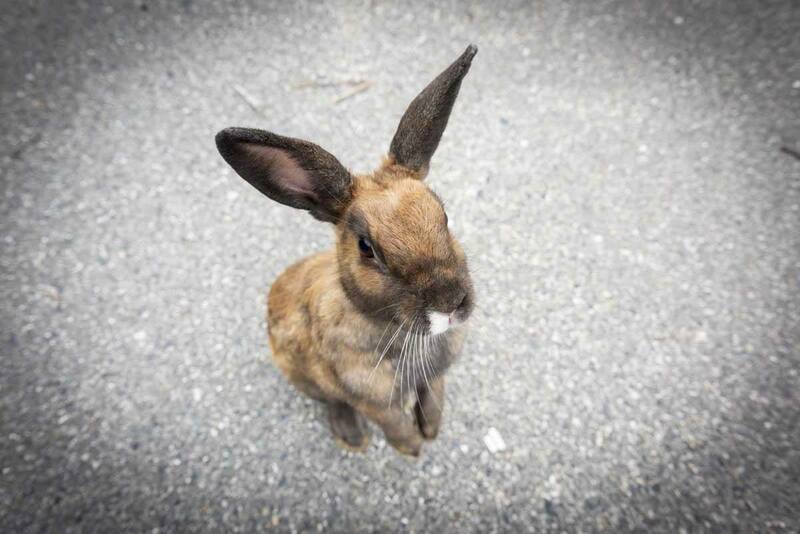 Not many people are aware of Okunoshima’s dark secrets nowadays – remnants of the poison gas factory still stand, amid the bouncing bunnies and bucolic scenery of Okunoshima, but they’re largely ignored by day trippers. Most people visit Okunoshima for the rabbits, to get that kawaii overdose that is the perfect antidote to the harsh reality of working in Japan – as we saw during our otaku tour of Akihabara. 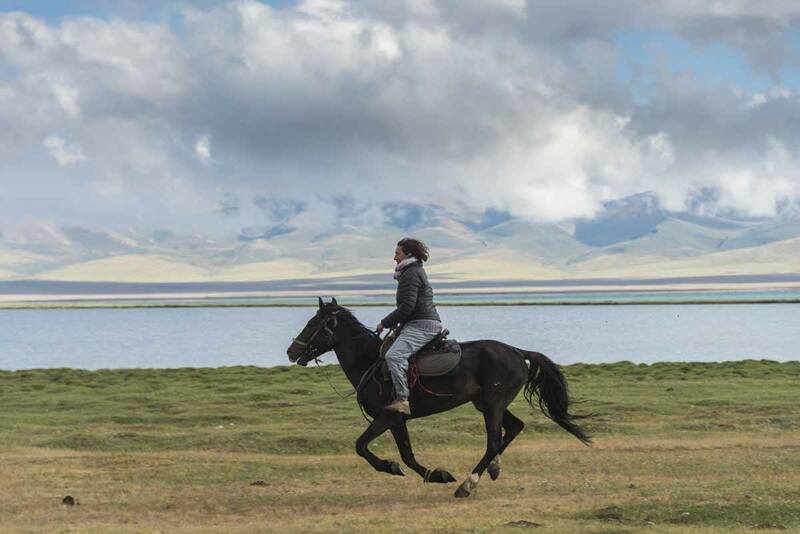 As the day went on and the weather improved, more people descended from the ferry – not just children and tourists, but also lone middle-aged men and women, all clutching a transparent plastic umbrella and bag of rabbit food. Yet, we were the only ones visiting the Okunoshima museum, opened in 1988 to share the horrors of what happened on the island. The museum is small and mostly aimed at Japanese visitors – but you don’t need to speak Japanese to see the horrific pictures of poison gas victims, exhibited in one of the two rooms of the museum. Visiting the Okunoshima Poison Gas factory was even more meaningful considering that the day before we had joined crowds of tourists and Japanese schoolchildren visiting the huge Hiroshima Peace Memorial Museum, detailing the apocalyptic effects of the atomic bomb that hit Hiroshima on Aug 6th, 1945. About half a million visitors cross the doors of the Hiroshima museum every year, and barely 50,000 make it to Okunoshima. Yet, in the words of Hatsuichi Murakami, the former curator of the Okunoshima Museum who worked in the poison gas factory as a teenager, ‘if you ask why America dropped the atomic bomb, Japan should also ask why it made chemical weapons at Okunoshima’. Much has been written about Japan’s victim consciousness – war remembrance in Japan seems to turn victims into heroes, focusing on atomic bomb remembrance but neglecting to acknowledge the horrors perpetrated by the Japanese during the war. The Okunoshima Museum confirms and denies this at the same time. On one hand, the museum is small and rarely visited – with only a fraction of those coming for the bunnies actually paying a visit. On the other hand, there is a museum, and the effects of poison gas are portrayed in a raw, eye-opening way. 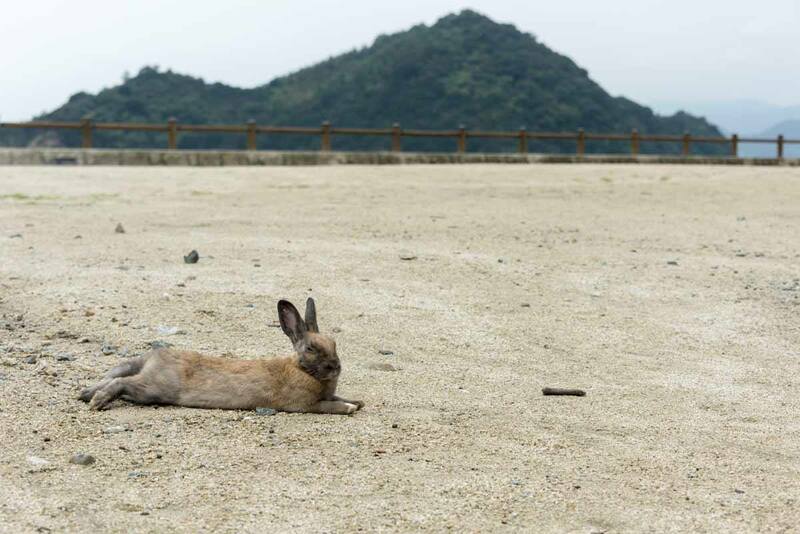 So, How did Okunoshima Become Rabbit Island? When the poison gas factory was in function, rabbits were used to test the effects of poison gas. 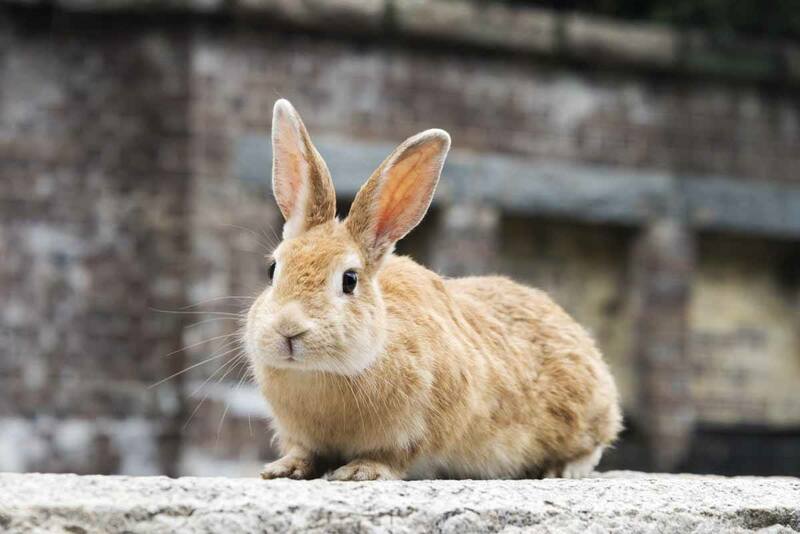 Some have claimed that the rabbits now roaming Okunoshima are the descendants of the same test rabbits, freed by workers when the end of the war was approaching. In fact, it is more likely that all rabbits were euthanised by US soldiers when the factory was dismantled after Japanese capitulation. 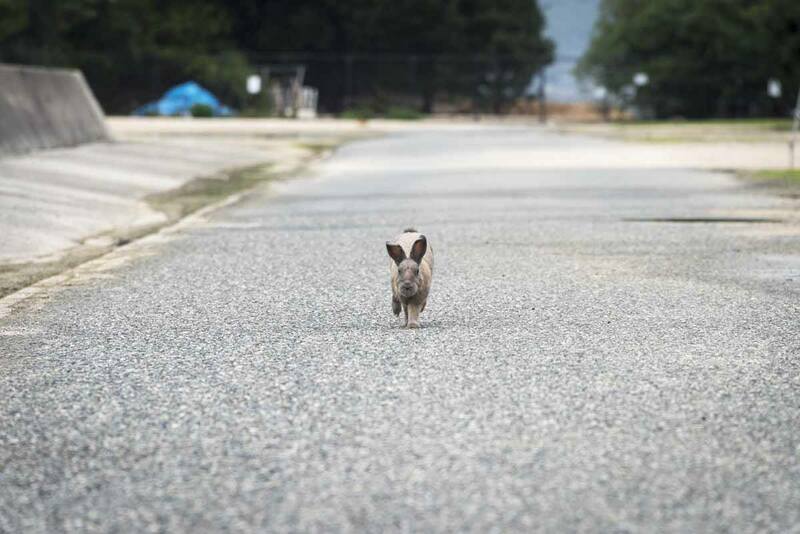 A new rabbit colony was brought onto the island in 1971 by a group of schoolchildren – they bred and thrived, as the island was completely predator-free. Were the rabbits taken to Okunoshima as a way to exorcise what the island meant in the collective memory, using ‘cute’ to escape horror? No one knows for sure. Nowadays, the rabbit population exceeds a thousand, even though the exact numbers are unknown. 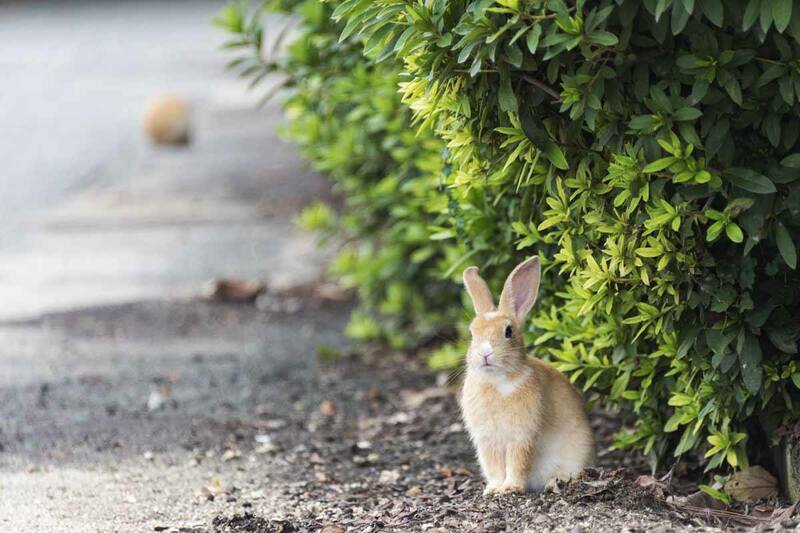 Ever since the island gained popularity, and tourists started visiting in increasing numbers, bearing food and treats from the mainland, the rabbit population has been growing at an unsustainable rate. Researchers that spoke with takepart.com have reported that the ‘rabbit boom’ on Okunoshima as a result of viral articles and videos may actually damage the rabbits. The situation is complicated – on one hand, it’s impossible for the rabbits to fend for themselves. 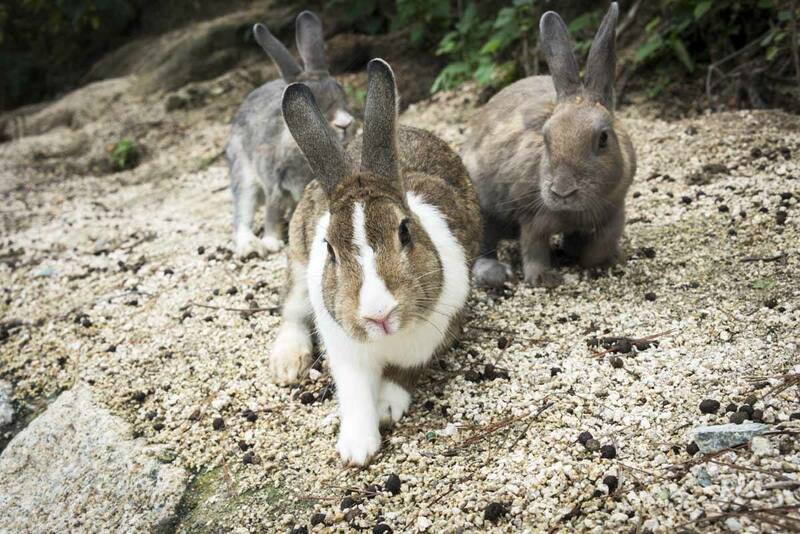 Okunoshima is still severely polluted – so much so that visitors are warned not to stray from official paths – and there isn’t enough food and space for so many rabbits on an island that is only two square miles. However, instead of purchasing rabbit food, many tourists bring cabbage or vegetable peelings causing potentially deadly bloating. Moreover, reliance on tourists for food means that rabbits end up gorging themselves on sunny days when lots of people visit the island, and virtually starve when it’s cold and rainy and no-one visits. 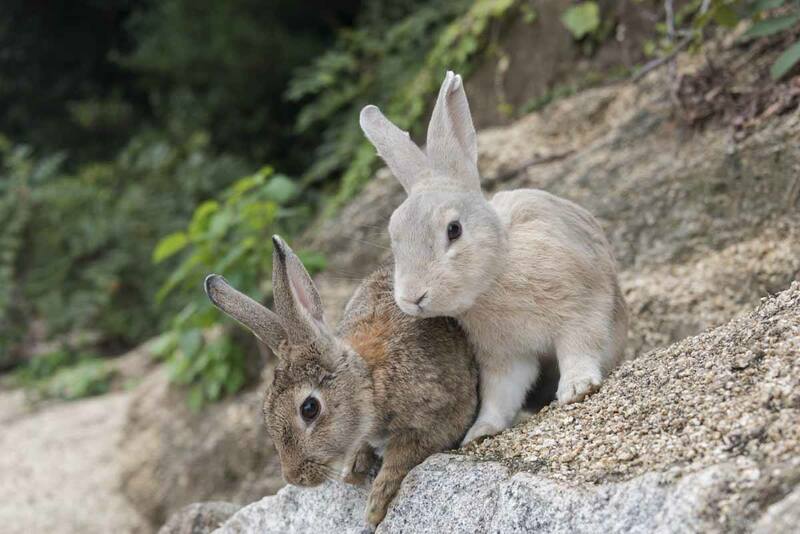 As a result, the lifespan of rabbits on Okunoshima island is only two years, while usually wild rabbits live between three and five years. 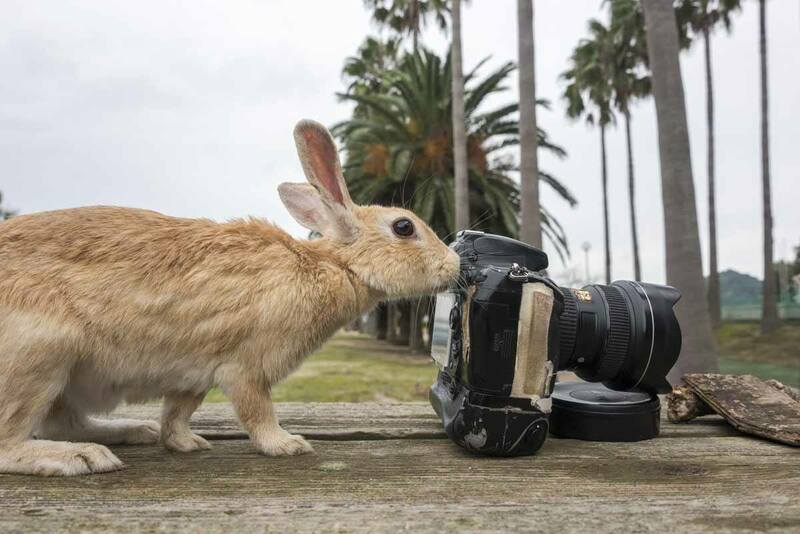 Yet, the survival of Okunoshima rabbits relies on tourists. 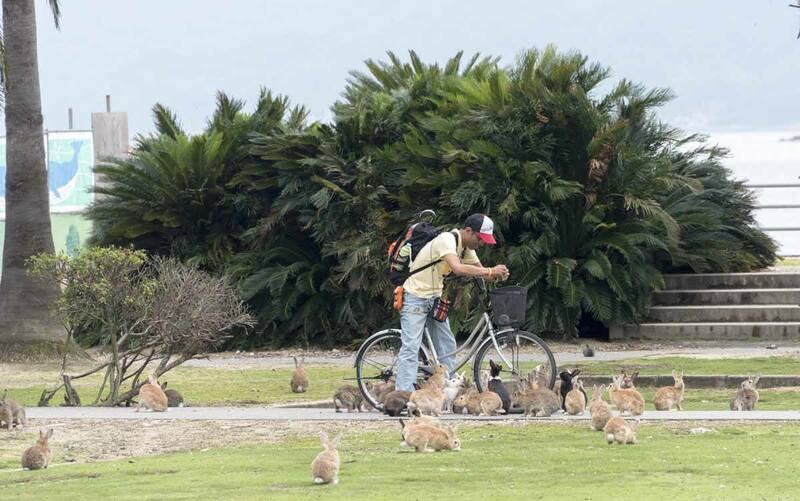 The rabbits are classified as wild animals, and no one feeds them when tourists don’t come. Yet, if the government caught wind that the increase in visitors is harming the rabbits, access to the island would be restricted and hundreds of rabbits will no doubt die. So, do we recommend visiting the Rabbit Island? Yes. It’s a fascinating place, both because of the kawaii rabbits (I don’t think anyone can deny that), and because of the island’s dark wartime secrets. Yet, please don’t visit the island carrying cheap, unsuitable food, in the hope to get a rabbit selfie or a ‘smothered by rabbits’ photo. Instead, stock up with rabbit food on the mainland (remember, it’s not sold on the island) and wander around – don’t just feed the rabbits gathering around the ferry landing or near the hotel. 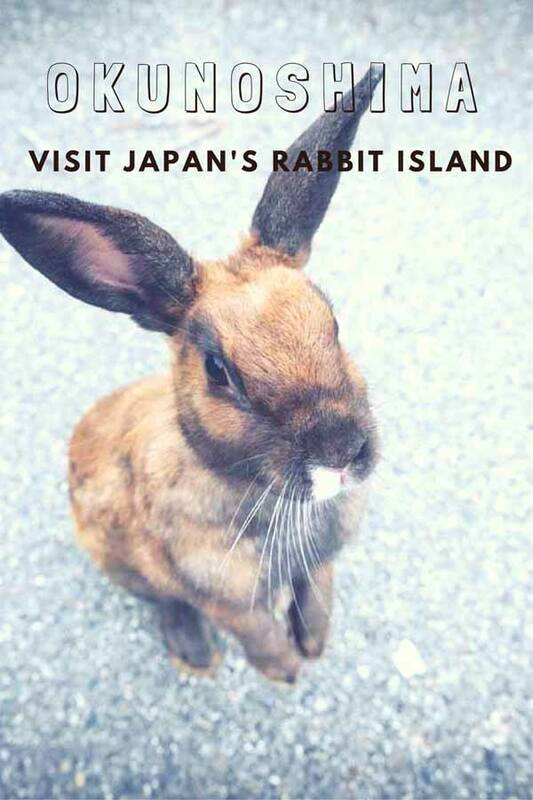 Take time to learn about the place, about its history and contradictions, and do your part to take care of its cute inhabitants, that make Okunoshima the rabbit island such a special, unique place. Take the Shinkansen from Hiroshima to Mihara station. Travel time is about 25 minutes. In Mihara, change for the Kure line to Tadanoumi, taking a further 25 minutes. There are wonderful views over the Inland Sea from the left-hand side of the train. Check train timetables on Hyperdia. The train journey is covered by the JR pass if you have one. Once you get to Tadanoumi, the ferry terminal is just a short walk away – you can get tickets and rabbit food there. This is the ferry timetable – the table on the left includes the time leaving Okunoshima Island, 大久野発, and the table on the right is for departure times from Tadanoumi, 忠海着, to Okunoshima. Round trip ferry fares are ¥320 for adults, ¥160 for children. 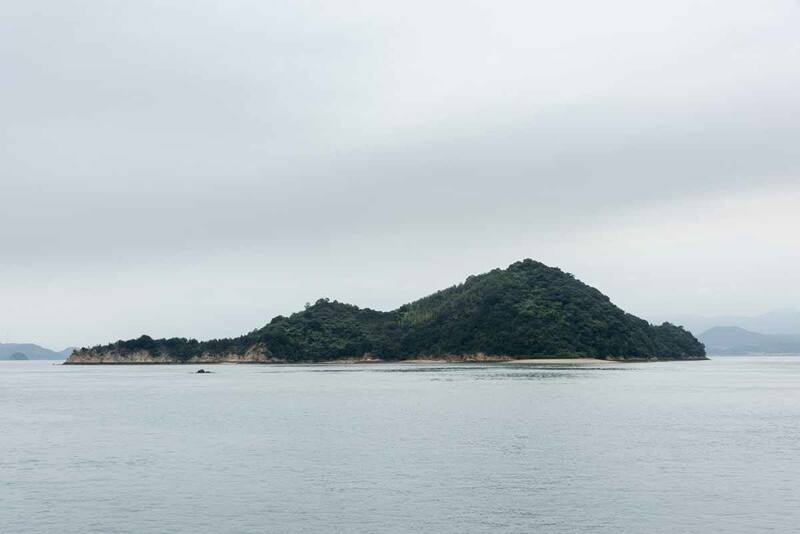 After our visit in 2016, a new direct ferry service called ‘The Rabbit Line’ from Okunoshima to Mihara was introduced during weekends and public holidays, saving visitors the hassle of changing to the local train from Mihara to Tadanoumi. There are five daily departures each way, and tickets cost ¥1500 each way, and ¥2400 return. Travel time is about 30 minutes. You can get more info on prices and timetables on the Rabbit Line English page! From Osaka, there’s a 6.59 Shinkansen departure, reaching Mihara at 8.55. From there, you can hop on the 9.30 departure of the Rabbit Line ferry if you’re visiting during the weekend, or make your way to Tadanoumi and catch one of the ferries from there – there’s a local train at 9.47, reaching Tadanoumi in 22 minutes, in time for the 10.25 ferry. To get back to Osaka in time for dinner, hop on the 14.25 ferry to Tadanoumi, and catch the 15.16 train to Mihara, where you’ll change to the Shinkansen via Okayama or Fukuyama. Always refer to Hyperdia as timetables change regularly! From Kyoto, hop on the 7.20 Shinkansen train reaching Mihara at 9.39, then either catch the ferry or make a dash for the Tadadoumi local train as explained above. To get back, the 15.16 local train is also the best bet – after catching the Shinkansen connection in Mihara, you’ll reach Kyoto around 18. Tokyo is really way too far to visit Okunoshima as a day trip. It is doable if you’re willing to fork out for a Nozomi train, which cost about €200 each way and is not included in the JR Pass, but really… why would you? Break up your journey in Kyoto or Osaka instead and continue your trip to Japan’s Rabbit Island from there! Where Can I Buy Rabbit Food? Remember, you cannot buy rabbit food on the island, you’ll have to get it in Tadanoumi before you board the ferry. Food is sold in paper bags that cost ¥100 each – don’t forget that fruit and veggies may not be suitable for the rabbits, so please make sure you only feed them rabbit food. How Much Does it Cost to Visit Okunoshima? There is no entrance fee to visit Rabbit Island. The only costs are the ferry ticket, rabbit food (of you want to buy some) and ¥100 ticket for the poison gas museum. 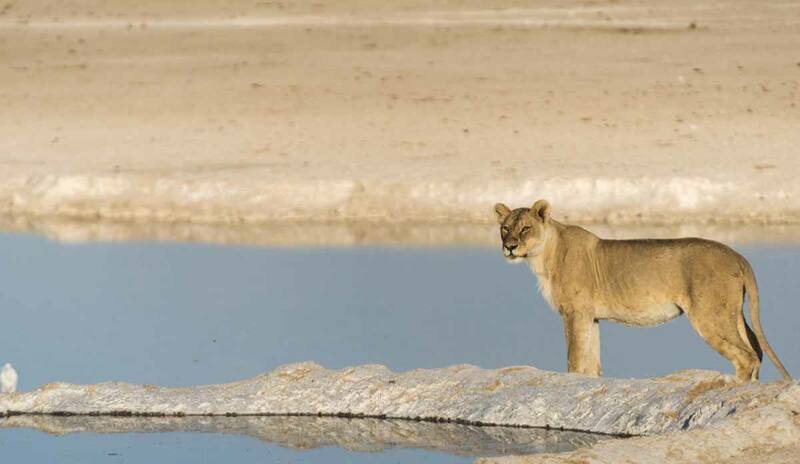 Are there Hotels in Okunoshima? There’s one hotel in Okunoshima if you miss the last ferry or just want to explore further. Are there Restaurants in Okunoshima? There only restaurant in Okunoshima is located inside the hotel, and there’s also a small convenience store inside. Alternatively, you can stock up with food and snacks at Tadanoumi – there’s a FamilyMart right next to the ferry terminal. Wonderful blog and great information about visiting Rabbit Island! I just went there this week and had a lovely time meeting the rabbits and exploring the island’s dark past (abandoned buildings). I find the history incredibly fascinating as well as sad. Thanks for all the great information! I hope you don’t mind but I linked your blog on my own about Rabbit Island.